Donald Trump's final ad of the US midterm election season was so racist, even Fox News decided to stop airing it. NBC ran the ad once during an NFL game, and was so deluged with complaints that the peacock network yanked it from commercial rotation. CNN and other networks refused to air it at all, and wouldn't sell the ad time. Facebook also banished the ad. Aside from the racist content - an unhinged attempt to spread panic over undocumented migrants, wrongly portraying them as invaders and criminals - the inaccuracies would be funny if not for the consequences of spreading hate. The ad tells of an undocumented migrant cop-killer, and claims Democrats would allow more like him into the country. But the truth is that the criminal in question was first deported during Democratic President Bill Clinton's administration; he sneaked back into the US under Republican Pres. George W. Bush. The criminal even once was captured but released by notorious Arizona sheriff and Trump ally Joe Arpaio. If Trump wanted to portray "illegal" immigration as a Democratic problem, he picked a case rife with Republican failures. But will it have any effect on Tuesday's Midterm Elections? It's hard to imagine that America's voters could be anymore polarized than they are already. Pundits say this election is for the soul of America. The conventional wisdom holds that the Democrats will regain control of the lower House, and the Republicans will retain the Senate. That would ensure two years of gridlock that each party will blame on the other into the 2020 presidential election year. But US politics are anything but conventional since the 2016 polls, so good luck predicting the outcome. The migrant caravan that Donald Trump tells his supporters is a threat to the United States is still nowhere near the southern border. The first of the Central American walkers have arrived in Mexico City, 1,000 kilometers away from the nearest border crossing at Brownsville, Texas. That would take them through some of the most-dangerous cartel territory in Mexico. With as many as 5,000 impoverished and desperate people walking in, the Mexican capital is preparing: "There are pregnant women, many children, vulnerable people and we have to guarantee the space and the services they require," said city leader Jose Ramon Amieva Galvez. A 33-year old Victoria man has died of his injuries after being "viciously mauled" by a shark at QLD's Cid Harbour. "He'd suffered very serious bites, significant blood loss as well as cardiac arrest," Central Queensland rescue crewman Ben McCauley said as quoted by the ABC. This attack happened as he and friends were enjoying a late Monday afternoon on the water; friends in a boat pulled him from teh water, but by then he had already sustained "horrific" injuries to his leg and wrist. The ABC also reports that a 46-year-old woman and a 12-year-old girl were attacked in separate incidents in the same area in September. The Cameroon government blames "rebel militias" for kidnapping 79 students and three others from a board school in the west of the small, African country. No single group has said it carried out the kidnapping at Bamenda's Presbyterian Secondary School, which has pupils aged between 10 and 14 - but secession movements have been growing in the area. Germany's former domestic security chief who was "kicked upstairs" after failing to acknowledge the far-right violence in Chemnitz has now been sacked from his cushy replacement job. Hans-Georg Maassen was forced into early retirement after a speech to other intelligence officials in which he claimed the center-Left junior coalition party the Social Democrats (SPD) harbored "left wing forces". His colleagues were appalled enough to leak the speech so he'd get the boot. In August, Maassen was removed from the top position at the domestic security service for not only failing to do anything about far-right violence in the eastern city, but actually denying it happened despite the existence of video showing right-wing mobs harassing and chasing migrants. His controversial transfer to a higher-paying job (which he just lost) is one of the elements that undermined confidence in Chancellor Angela Merkel's coalition before recent state elections. Paris ambulance drivers brought traffic to a standstill with a "snail" protest on the French capital's main ring road. The drivers are protesting plans to change the way ambulances are assigned during emergencies, removing the decision from individual patients and giving it to hospitals. Smaller operators say they will not be able to compete. Two old buildings collapsed in Marseilles, injuring at least two people. 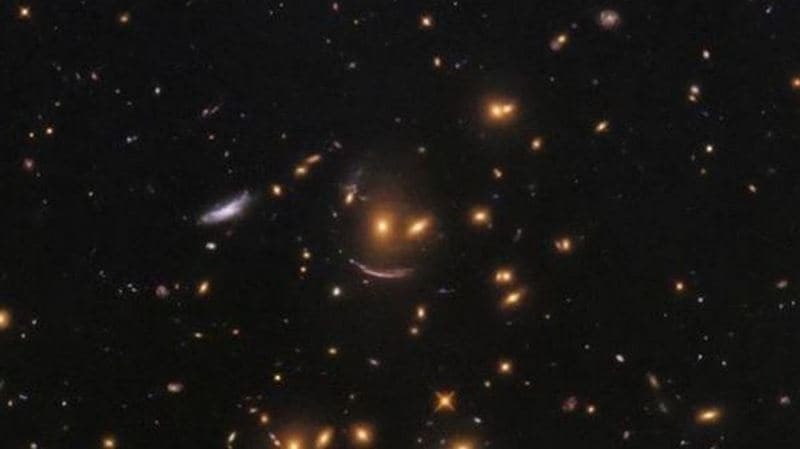 NASA's Hubble Telescope took a gander out into deep space and saw something smiling back. The image shows two yellow orbs above an arc of light - effectively painting a smiley face in space. Hubble came across the happiest place in the universe while peering at the formation of distant galaxies in the SDSS J0952+3434 cluster, where the gravity bends light coming from behind it in a similar way to how the base of a wine glass bends light. All this is about 11 billion light years away - so even if we had a space ship with warp drive, it's not like we're going to do anything more than look anytime soon.